As one of the most petitioned feature according to Sony, the company today released its cord-cutting service – PlayStation Vue – to Apple TV customers. The app brings many stunning features to Apple TV customers such as cloud DVR, simultaneous streaming, and no long-term contract commitments. The app is now aviable on 4th-gen Apple TVs. The app allows you to take advantage of Apple TV’s Siri Remote and easy navigation with touch. 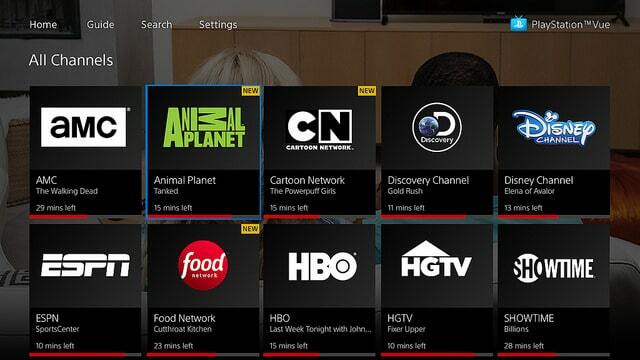 The PlayStation Vue service is one of the best service cord-cutters can subscribe to. Within the app, you can watch popular programming, from live sports networks like ESPN and NFL Network, to premium channels like AMC, FX, HBO, and Showtime. If you do not have a PlayStation Vue account yet, you can sign up for a starting price of $29.99 through the PlayStation Vue website and link your account to your Apple TV.